Before I became a father, one of my many reasons for not wanting to take that step was that I thought parenthood meant life would be static. You had a kid and disappeared, sitting at home waiting for your child to grow up into someone interesting. By the time that happened, you’d be fossilized and waiting for the lights to dim. Fzzzt — thanks for playing! Parenthood, I was relieved to discover, wasn’t like that at all. With a little planning and mutual understanding, neither you nor your spouse have to disappear from the rest of the world. Yes, the first few months are tedious — you’re an unpaid attendant for a squalling, helpless lump. But kids get interesting a lot more quickly than I’d thought — they’re soon revealed as surprisingly sophisticated little beasts, with nuanced personalities, complex social lives and very adultlike gifts and flaws. And in creating the adults they’ll one day become, they change a lot — the problem you’re wringing your hands over today may be licked in a month, while the part of child-rearing you think you’ve got under control now may crater in a few weeks. A wise parent neither declares victory nor concedes defeat. Joshua has been raised by two fairly lunatic Mets fans. The Mets have been a daily presence in his life since his earliest memories, helping dictate his parents’ schedules and driving a steady flow of clothes and gifts. Before he was born, his grandfather fashioned a rather amazing cradle for him, with one end painted like the Mets logo and the other painted like a baseball, with baseball bats for handles. It’s safe to say he never had a choice of allegiance. The Mets’ shocking fall from relevance, though, has been tough on him. On the final day of 2007, I knew once Ramon Castro’s drive fell short in the bottom of the first that we were beaten. But Joshua was not yet five, and he really believed the Mets would win until the F in the line score dictated that they could not. A certain Braves pitcher may have been disappointed, but Joshua was devastated. He was befuddled and sad when the same scenario played out the next year, and then the Mets collapsed, undone by injuries, financial nuclear winter and the routine cold-eyed baseball calculations. Taken together, these things stripped the team he knew of the players he’d loved. Carlos Delgado retired. Carlos Beltran was traded. Jose Reyes left for the mayfly millions of Miami. R.A. Dickey won a Cy Young award and a ticket out of town. Johan Santana’s aged shoulder betrayed him. Only David Wright stayed — but by then Joshua was old enough to question the value of a single star surrounded by a wan supporting cast. It was a brutal winter for questions. We talked about how players age and injuries snowball on them, no matter how hard they work and want to compete. We discussed why gaining years of Zack Wheeler had been worth sacrificing months of Carlos Beltran. We argued about the offer the Marlins had made Jose and whether matching it would have made sense even if the Mets had been capable of doing so. We explored the future of R.A. Dickey versus those of Travis d’Arnaud and Noah Syndergaard. We delved into what had happened to the Wilpons and their money. We discussed whether Sandy Alderson was savior or enabler or something in between, and when we might be able to say for sure. At one point the kid got mad at me — I don’t remember if it was about Reyes or d’Arnaud or Wheeler or just some abstract principle. He said that what I was saying made sense, but I didn’t understand how much this hurt, how awful it was to see player after player depart and wonder if this fandom thing was even worth it. Oh yes, I said, I understand. I said I know what it’s like to see your favorite player, the one you remember your mom cheering for when you couldn’t have been more than three or four, traded to the American League for a tubby pitcher who retired to run a doughnut shop, then unretired when safely away from the Mets. I said I know what it’s like to wake up and see the Mets on the front page because they’ve traded the greatest player in team history, a public suicide that announces your team is now baseball’s North Korea. I said I know what it’s like to learn your downtrodden team’s one intriguing player has been shipped off for a pair of Texas minor-leaguers you’ve never heard of and can’t imagine ever caring a hill of beans for. I said I know what it’s like to learn your supernaturally gritty, amusingly addled centerfielder has been turned into a Phillie, along with the jokester reliever everyone loved, in return for a guy you’re pretty sure is already out of position. I was the calloused fan hardened by knowing about payrolls, and drunken owners at the free-agent troughs, and Super Twos, and it being better to trade a guy a year too soon than a year too late, and bad luck and mistakes and everything else. The questions my kid was asking called for answers that reflected that knowledge, but I hesitated at passing it on. Because my kid was a kid, and that has a value we don’t appreciate until it’s too late. So there we were on Opening Day, beneath a sunny sky and a brisk wind, and I was hoping for a Mets win — not just for all the obvious reasons, but to sweep away the mess and muck of winter, replacing abstruse talk of finances with the simpler, happier stuff of high fives and risen apples and scoreboard entreaties to clap, clap, clap your hands. Joshua and I got all that and more, as the Mets ambushed Edinson Volquez and the Padres early, then poured it on. It was what I needed, what we all needed, but most definitely what my kid needed. There was Jon Niese, looking not at all dull with a baseball or a bat in his hands. There was Daniel Murphy, swinging the bat on his birthday like sitting out spring training was the best idea in the world. 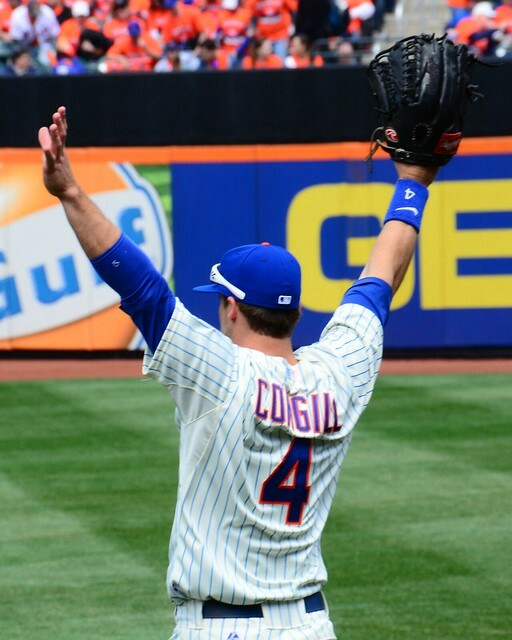 And there, best of all, was Collin Cowgill. Yesterday morning I probably would have misspelled Cowgill’s first name, and I doubt Joshua would have recognized either first or last. By yesterday afternoon, the kid was a charter member of Team Cowgill. There was the grand slam, of course, a laser to reconfigured left field that came with a brief, Santosian delay before it could be celebrated in full. But there was also the sight of Cowgill turning a single and Carlos Quentin’s misadventures into a double, his sensibly policing Lucas Duda’s galumphing around left, and the general impression of barely contained mayhem left by our pint-sized, curiously cat-eyed new outfielder. To me, Cowgill’s number says Dykstra while his hustle says Miller with a side of Cangelosi. To Joshua, he’s just Collin Cowgill — and that’s good enough. Baseball is humanity’s greatest artform, played by a never-ending succession of boys of summer. That’s its glory. The sadness creeps in with the fact that those boys of summer arrive with built-in expirations, unknown to us or to them but inevitable nonetheless. New boys of summer are always arriving to take their place, which is glory and sadness intertwined and inextricably tangled. I was thinking of all of that yesterday — of arrivals and departures. So was Joshua. By the end, though, he was thinking only of arrivals. And that was as I desperately wanted it to be. You’re an excellent writer and this was a joy to read. Let’s hope this year’s Mets bring us joy (almost?) as often as they pain us. LGM. lovely piece, jace. my own son is now 16 and the mets have stolen his childhood through one bad “business decision” after another. keep joshua as insulated as you can. Thank you once again for a wonderful read and for putting so succinctly why I love baseball and our Mets. Enjoy the bond that you and Joshua have….my son, now 30 also shared that bond growing up, but lost interest in his teens. While no one can predict the future, having a future is a joy in and of itself. I was talking to a Dad and his son in the, well, the bathroom at Shea during the 2006 NLDS and said, “He’s six and seeing your first playoff game. I was 21. You don’t know how lucky you are.” That kid is 13 now and either is well aware of his “luck” or has quit watching baseball all together. It’s tough raising Mets fans, but it provide the necessary lesson that life is not abundantly fair. Start following the Blue Jays for a while. Take your mind off the Mets until they get some more pitching. And outfielders. OK, don’t be intentionally opaque. Who was the tubby pitcher? Mickey Lolich — not as terrible as a Met as is generally remembered but was no Rusty…certainly not to a kid. So happy that father and son had a wonderful time at the park on Monday. My 18 year old daughter has the same bilateral genetic affliction, born a no-choice Mets fan. In a way, it might be easier to keep girls true to the faith, they don’t have the same type of peer pressure, they’re not as strongly associated with their team of choice as boys are by their friends. While she’s usually dressed as a budding hipster otherwise, she wears her Santana and Davis and Wright t-shirts to gym class and chances are when she’s away at college next year (500+ miles away, closer to cornfields than CitiField), she might be the only Mets fan on campus. But they come home…faith can be challenged, but real faith stands the tests. Joshua’s off to a good start.